7 night Intercontinental Resorts Moorea and Bora Bora package. You’ll start with a 3 night stay at the Intercontinental Moorea Resort & Spa, home to the popular Moorea Dolphin Center and Sea Turtle Clinic. Fly to Bora Bora for a 4 night stay at the deluxe rated Intercontinental Resort & Thalasso Spa Bora Bora where you’ll retreat to your private villa decorated in a traditional Polynesian style yet including the latest technologies. Here you’ll exchange your vows in an intimate blessing conducted by a Tahitian Master of Ceremonies with Flowers, a Certificate on traditional Tapa and a Champagne toast to celebrate this special occasion. 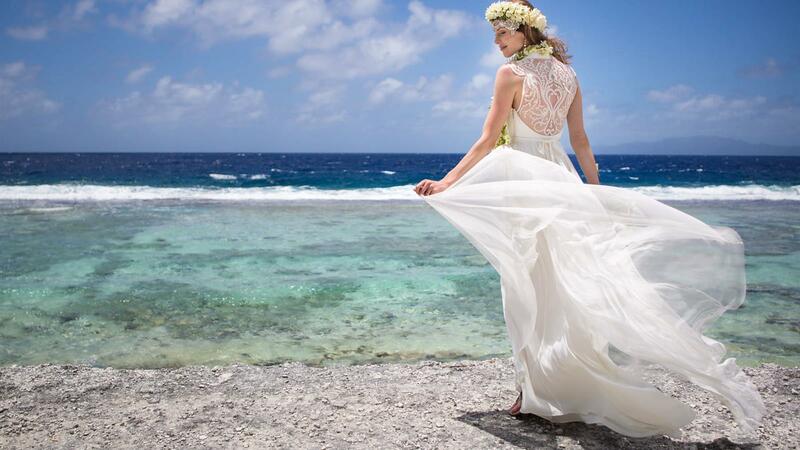 Package includes Full Breakfast daily, a Tahitian Black Pearl for the Bride, Intimate Ceremony at the resort on Bora Bora, Hotel Bonuses such as Champagne and a Polynesian Gift for the Bride. International and Inter-Island Airfare and Airport Transfers included.